The title says it all really. One of the troubles with the digital age is that the images of these new watches on screen and on-line are in fact enhanced artistic license images and NOT often the reality. And this phenomenon isn’t just a Gents prerogative either – it also affects those modern women and ladies who have embraced the larger masculine style of watch today. You buy the super watch you saw on-line and when you get it, you can’t make out the time. It has no contrast or the light is shining at it in the wrong direction and so on. So it’s nice to spot a watch for the Ladies – and the men as it happens, the only difference basically is the color set up from Calvin Klein, that appears to me to maybe overcome the clarity issue. I say maybe as I too have only seen them on-line, but at least the retailer I spotted shows a video. So maybe a more accurate representation and possibly worth a look. 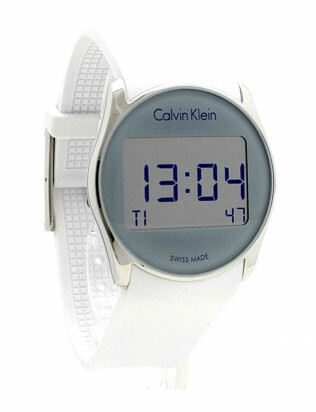 The Calvin Klein Future Alarm model as it’s called for ladies has a nice color way and isn’t very large by todays standards, but actually a nice size for anyone with sensible wrists. It measures 38 mm diameter and is only 9 mm depth, so neat on the wrist, ladies or gent. The Ladies version has a white rubber strap and rather stylish colored LCD with blue numerals, which appear to have really decent contrast. The watch has two pushers on the right side a Date feature and an Alarm. It also has a nice smooth case set up with a decent 30m Water Resistance. 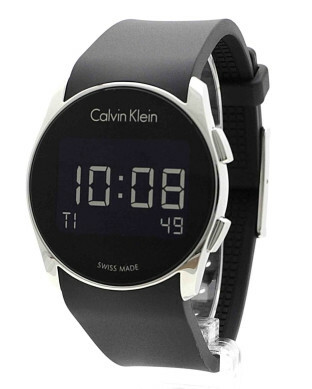 It comes with the Calvin Klein 2 yr Warranty and costs around £160, which is reasonably affordable today. The colour combination I think works for ladies and IF the contrast and legibility is as I would hope, then this is a pretty good buy. The Gents model is only different in the colour and is slightly thicker at 10 mm, so it is said, but the same otherwise. The Gents version also has the usual macho dark dial job, though in this case I might prefer the Ladies one – as I have a feeling the color set up just might be better clarity wise, though would I dare wear it? Come to think of it – I probably would! Unisex is Unisex – right?